It wasn’t a trip to the park or the prospect of a new toy that excited Brooke Wagner as a little girl. For Wagner, it was the sound of drills, the image of hard hats and cranes — it was the times she tagged along with her dad on the job, where she got to witness a home being built start to finish. Wagner’s love transformed into a business — she created her own firm Brooke Wagner Design, where she creates stunning custom homes for her clients. The home features warm wood tones contrasted with cooler stone. Wagner incorporated Polycor’s White Cherokee American marble throughout, placing it in the kitchen, the bar, and the living area. One of the highlights includes the dramatic fireplace surrounded by Polycor’s ultra-thin 1 cm marble slabs that runs all the way up to the 10 foot high ceiling. Fred Paulk, of American Marble, worked as the fabricator on this project. He said not many lightweight materials, like the 1 cm marble are available in the marketplace. Slabs typically are cut at 2 cm or 3 cm. White Cherokee, and it’s darker veined cousin Pearl Grey, are both Georgia marbles, quarried by Polycor in Tate, Georgia. These dense and stain resistant thin stone slabs are available in a variety of vein patterns from subdued to highly figured. This stone was sourced through Stoneville. Wagner utilized the same 1 cm slabs in her own home behind the range in the kitchen — she said the thin material makes the job easier and safer for the fabricator when it comes to adhering it to vertical surfaces. That Wagner spec’d a natural material that reflects the environment and the laid back California lifestyle is no surprise. 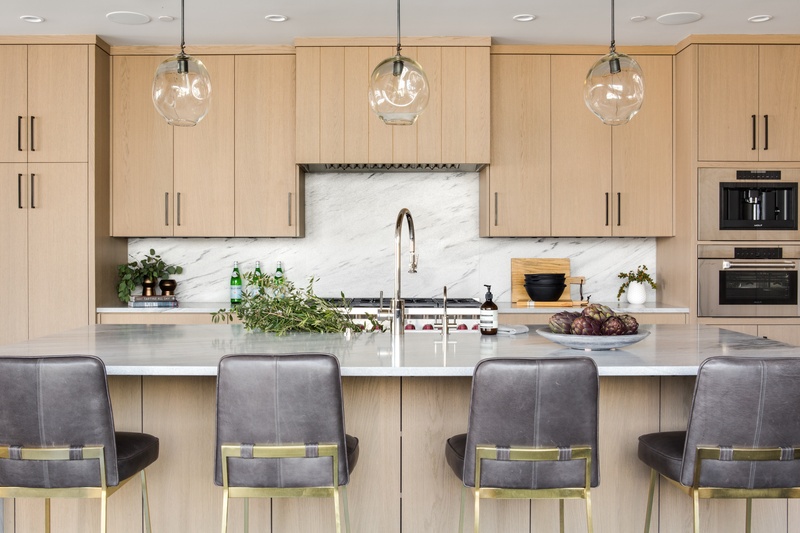 In her own home, and in many of her client projects, this designer leans away from manufactured stone and chooses marble for its texture and organic movement. "Nothing can compete with a piece of natural stone - marble, limestone or soapstone. Even though quartz has gotten really good over the years I can always tell the difference. I had white marble in a past home. Aesthetically, you can’t beat it." Wagner said. See more designs with ultra-thin American marble slabs. Download the Thin Stone Lookbook.